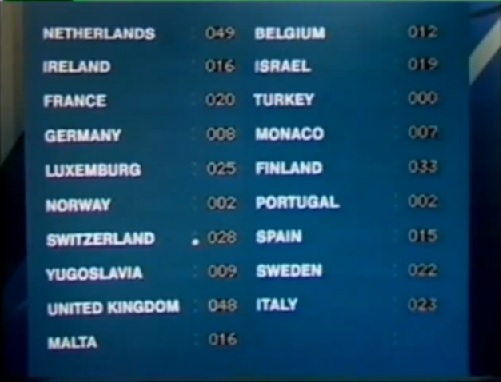 Here are my choices for best songs at the 1975 Eurovision Song Contest. I’d heard the Dutch entry before but not the other songs. Turkey made its debut in 1975 but finished in last place! Ironically, I thought Turkey had the best song by far that year. I also thought the German entry was outstanding, but it finished in 17th place out of 19 entries. What was with the judges that year? The scoreboard was particularly smart looking–minimal yet striking, and easy to read. It looked like something you’d see in a really cool airport.